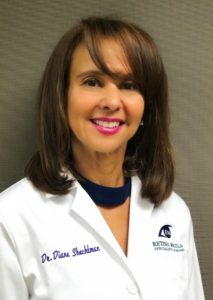 Dr. Diana Shechtman is a board certified optometric physician. She completed her undergraduate studies with honors at University of Florida. She was awarded her Doctor of Optometry degree with honors by Nova Southeastern Uni­versity College of Optometry. In 1999, she completed a residency focused on the diagnosis and management of ocular disease at Fox Med­ical Center in Miami, Florida. She then joined Nova Southeastern University College of Optometry where she was promoted to the ranking of Professor and served as a full-time faculty member for 18 years. In 2016, she completed a 6-months sabbatical focusing on the diagnosis and management of retinal diseases. She is currently a consultative optometric physician at Retina Macula Specialists of Miami. During her academic career, she was recognized with numerous awards for her excellence in teaching. Among her many roles, she served as the primary instructor of Optometric Theory & Methods, a clinician in the Eye Care Institute, as well as the coordinator of the Diabetes & Macula Service and the Director of Interdisciplinary Education. Dr. Shechtman is a fellow of the American Academy of Optometry (AAO) and the Optometric Retinal Society (ORS), where she also serves as an Executive Board member. In addition, she continues to serve as a member of numerous professional committees. She is also on a number of Advisory Boards and Professional Speakers Bureau for various companies. Dr. Shechtman is on the Editorial Review Board of multiple professional journals. She co-authored the Research Review column and was the lead author for the Interdisciplinary Care column. Dr. Shechtman continues to publish numerous posters and peer reviewed articles focusing in the area of retinal disease. She also continues to participate in various research grants and projects. Dr. Shechtman has lectured extensively at a local, national as well as international level in the area of vitreo­retinal disease. Dr. Shechtman is fluent in Spanish.